Choosing the right brand of colored pencils for your drawings can sometimes be overwhelming. There are simply so many brands out there and the characteristics of each brand varies greatly. There are pros and cons to each brand and knowing which pencils are right for you requires experimentation and can become quite pricey. Check out my colored pencil comparison chart and see what brands I recommend here. Recently, I was sent a set of Ariana's Art Vivid Color colored pencils to review. These pencils are new to the already flooded market, but have quickly become very popular. In fact, at the time of this writing, they are in such demand that there is a two week waiting period for the pencils. These pencils are described as "Artist Quality" with soft cores. In the description, they claim that the cores are strong enough to withstand breakage, a common problem experienced with Prismacolor colored pencils. The barrel of the pencils is a rounded triangular shape, making them less susceptible to rolling off of your desk. Some will also find the triangular shape a bit more comfortable to hold. We'll get to the pigmentation and quality of the binder in a moment, but first I'll describe the case that is included with the set. I must say that the case is very impressive. It is a canvas "fold over" case that buttons keeping the pencils in place. Each pencil is secured in its own slot. Needless to say, the case makes traveling with the pencils easy. The set also includes a vinyl eraser and a plastic pencil sharpener which is held in its own pouch within the case. The set includes 48 pencils and to my knowledge, these are the only colors that are available. This is clearly a drawback because the range of the colors is limited. The darkest blue is not very dark and the darkest brown isn't either. Since colors are only available in the set and not sold individually, replacing a color when you need a new one will be a challenge. The set is heavy with florescent colors, which I rarely ever use. Of the 48 colors included in the set, I only envision using about 30 of them. That being said, the strength of the brighter colors is very nice. The strength of the wax core is clearly stronger than what you'll find with Prismacolor pencils. Of course, this comes with a trade off. While the core is stronger, the pigmentation is noticeably weaker. Layering colors requires a bit of strength and heavy pressure. The white pencil, which is often used for burnishing, is particularly weak. When I used it to adjust the value, I had to put an enormous amount of pressure, and then only affected the value slightly. The binder is strong, but doesn't spread the pigment easily. This could be an advantage for those that want to layer colors slowly, but a disadvantage for those wishing to influence the color and value with multiple layers through heavier applications. A bit more planning must be done to produce accurate colors. Normally, I would use a combination of dark blue and dark brown to produce a natural black in a colored pencil drawing. When using these pencils however, this was not easily accomplished, so I found myself reaching for the black pencil. I was pleasantly surprised to find that the black produced a tone that was not overwhelming and could be used for pushing the colors a bit darker. The real strength with these pencils is with the brighter colors. The pigmentation is quite strong and the color is, as the name implies, vivid. Unfortunately, the weakness is in the colors that are most used in representational or realistic colored pencil drawings - dark blues, browns, and white. For those that work with mostly bright colors, you'll find that these pencils provide you with fairly intense colors. The brighter colors impressed me the most. If you prefer to layer colors with "lighter" applications, then you'll like the fact that the colors are laid down with minimal affects to colors underneath. This allows the color to be slowly altered with a bit more control. If you're looking for a more professional wax-based set, I would stick with Prismacolor pencils. The oil-based Polychromos pencils by Faber-Castell are also quite nice, but a bit more expensive. The drawing is first drawn on Bristol paper (Vellum surface) with an HB pencil. Then a series of warm and cool grays are applied. The value is adjusted by layering dark blues, browns, and black. Color is slightly adjusted with an application of yellow-green. Work continues down the body of the can with applications of gray. White is used to burnish the color, but heavy pressure is required. Red is applied and the value is adjusted with brown and white. The middle portion of the can is next addressed, again with applications of warm and cool gray. Subtle reflections of red are easily accomplished with these pencils. The bottom portion of the can is completed as darker values are pushed with light applications of black. 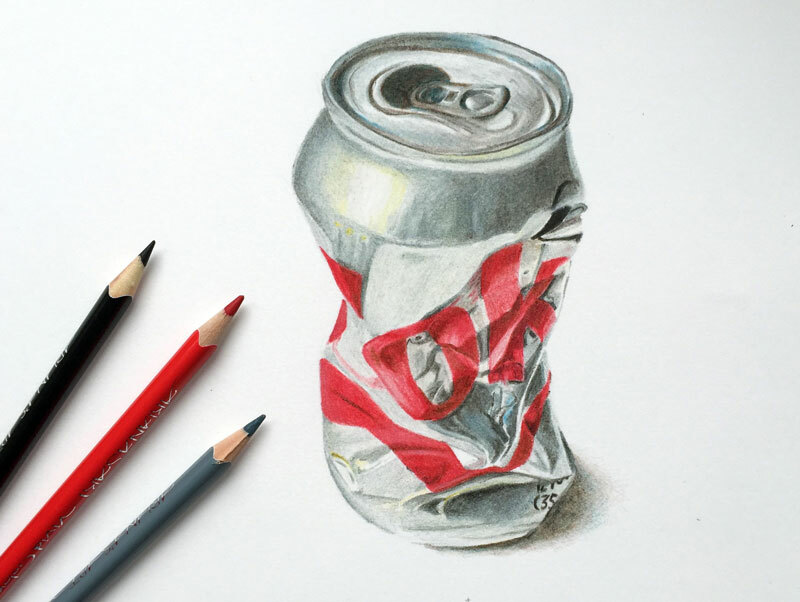 The drawing is completed with a bit of shadow underneath the can. Warm gray, brown, blue, and black are used to create the cast shadow.